ATTLEBORO, Mass. – In their final game of the season, and for many of their seniors the final of their soccer career, the Attleboro High School Lady Bombardiers relied heavily on the defensive back line and sophomore goalkeeper Madison Brown to contain rival North Attleboro, a team which had beat them 5-1 earlier in the season. 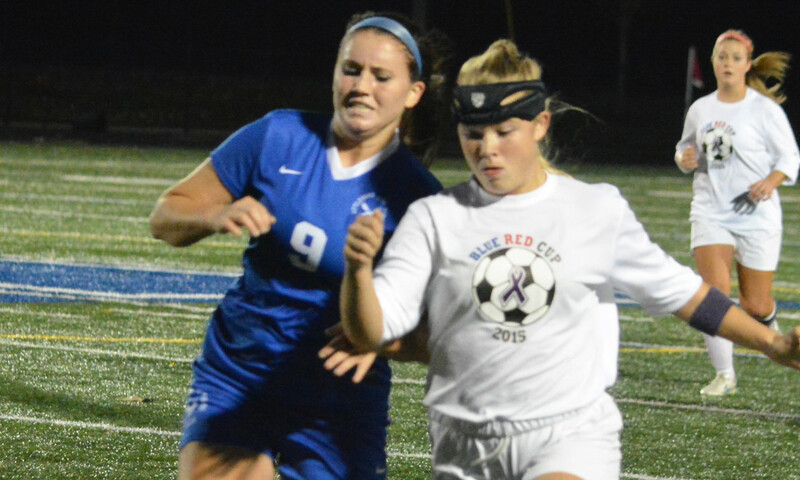 Thanks to a goal from junior forward Rebekah Entwistle, Attleboro topped North 1-0 to take the Blue and Red Cup Thursday night at Tozier-Cassidy Field. Brown made 13 saves, including some very serious chances by the Rocketeer forwards, to help her team to victory and earn the Outstanding Player honors for her side. Senior forward Hana Caster took the honors for North Attleboro, having been key in some of Big Red’s biggest offensive threats. The Rocketeers came out of the gates the stronger team, dominating possession and keeping play in the Bombardier defensive end, putting up a few chances within the first few minutes. They’d be given a free kick in the eighth minute. The resulting kick, though in a dangerous area, would fizzle after not long after hitting the wall and the game would remain scoreless, and North Attleboro would continue to be the stronger side, nearly scoring in the 17th minute after Caster’s cross found sophomore forward Haley Guertin, who sent a hard shot right into the arms of Brown. The Attleboro offense would soon begin to wake up and attempt to make some chances of their own, as Entwistle was stopped by North goalkeeper Kiersten Bixby in the 23rd minute. She’d get close again with Hannah Meier almost getting on a chance at an open net before Bixby fell on and covered the ball. But after several chances, Entwistle would finally put one past the keeper in the 40th minute. Senior midfielder Kayla Merritt played a pass upfield to Entwistle, and despite being denied by Bixby on the first attempt, tucked the rebound into the net to give the Bombardiers the 1-0 lead shortly before the first half came to a close. “[Entwistle’s] just one of those people that once she gets going, she gets the momentum behind her, [and] just a hard worker who fights for her goals,” said Santos of the junior. As the second half opened, it was clear the tides had turned as Attleboro took control, though North Attleboro certainly showed no signs of giving up anytime soon. After a Bombardier chance early on, chaos erupted in front of their goal in the 53rd minute as a free kick sent in front of the net resulted in several close calls for an equalizer and forced two Brown saves before finally bouncing off the crossbar and out of danger. Only five minutes later, Felicity Monfils’ shot would go off Brown’s hands and off the crossbar and out and off the football goal post above it. Attleboro would switch to a more defensive-oriented plan for containing their rivals in the second half rather than trying to add to their totals. In their final game as Lady Bombardiers, the seniors certainly played strong roles in keeping North Attleboro at bay. Paige Medeiros and Hayley Cassidy both proved strong on the back line, as well as Madison Turner, and in midfield, Merritt, Breanna Eddy, and Cassandra Vivar did their best to disrupt their rival’s ability to create chances. Eddy nearly had an offensive chance of her own in the 64th minute before the ball was scooped away to safety by Bixby. The rest of the game seemed to keep everyone on edge, as both sides looked to get their way but with Attleboro prevailing in the end. North Attleboro may have equalized in the 65th minute as Caster appeared to be on a breakaway but would called a very narrow offsides to end that opportunity. After making a few stops near the end, Brown would hold onto the ball on her last opportunity until the referee blew the final whistle to seal a Big Blue victory. Following the end of the hard-fought match, the trophy was presented to the winners, who now tied the Blue and Red Cup series at two games a piece. For the seniors, who spent much time with the trophy taking picture after picture, it was bittersweet. Looking forward to the future, however, Santos seemed optimistic in his team and their chances to come. North Attleboro still has one game remaining in their regular season before they head into the tournament, as they’ll play hosts to Durfee Saturday for some non-league Halloween action. Foxboro, 4 @ Mansfield, 2 – Final – Devante Teixeira scored a pair of goals and had two assists for Foxboro. Anthony Barreira scored the other two for the Warriors. James Chotkowski opened the scoring for Mansfield, assisted by Max Gurnon, and Jared Miller added a penalty kick in the final 10 minutes. Attleboro, 2 vs. New Bedford, 1 – Final – Rebekah Entwistle scored with 10 seconds left in the game on assist from Cassandra Vivar to give Attleboro its third straight win. Entwistle also scored the tying goal in the second half off an assist from Paige Medeiros. Madison Brown made eight saves to preserve the win.